One of the most authentic and unspoiled destinations in Southeast Asia, Cambodia attracts adventurous travellers with remarkable ancient temples, unique cultural experiences, and picturesque rural landscapes. Even the historical horrors of the Khmer Rouge draw tourists, with attractions like the notorious Killing Fields serving as harrowing reminders of Cambodia's most turbulent and tragic chapter. Nestled along the tropical waters of the Gulf of Thailand, sharing boarders with Vietnam, Laos, and Thailand, Cambodia has a lot to offer intrepid visitors. Travelling by tuk-tuk along the chaotic streets of French-flavoured Phnom Penh is a must. Cambodia also promises idyllic beaches, usually less crowded than those of its neighbouring countries. However, by far the most popular attraction in the country is the ancient temple complex of Angkor, a magnificent 'Lost City' which is undoubtedly one of the most magical tourist attractions in the world and a bucket-list destination for many. Although Cambodia is still most popular with backpackers and budget travellers, luxury accommodation and amenities are on the rise, catering to the increasingly diverse crowds wanting to explore this beautiful country. 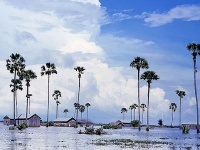 The weather in Cambodia is typically tropical with distinct wet and dry seasons. The best time to visit Cambodia is in the cooler dry season, from November to February, when temperatures are more comfortable. For visiting the temples at Angkor, or enjoying the beauty of the Tonle Sap in full flood, the best time to go to Cambodia is during monsoon season, from June to October, but temperatures and humidity levels can rise high during this period. Read more on Cambodia's Climate and Weather. -Make a pilgrimage to Angkor Wat for sunrise before touring more of the ancient temples near Siem Reap. -Take a boat from Chong Khneas to the 'floating villages' on the massive Tonle Sap Lake. -Visit the tiny village of Kratie to view the rare Irrawaddy River Dolphins. -Take a tuk-tuk to the Tuol Sleng Museum and the Killing Fields for a glimpse into the tragic history of Cambodia. Read more about Cambodia Attractions. -Shop till you drop at Phnom Penh's famous Russian Market. -Learn how to cook the famous Fish Amok (Amok trei) at a Cambodian cooking class in Phnom Penh. -Picnic on the banks of the Mekong on the lawns of the Royal Palace. -Indulge in a Seeing Hands Massage done by expert blind masseuses. Direct flights to Cambodia are not currently available from the US or UK but indirect flights are operated by several airlines. Flights to Siem Reap Angkor International Airport are available from regional airports such as Bangkok, Singapore, Ho Chi Minh City, Kuala Lumpur, and Seoul. Get more information on Cambodia Airports. Angkor beer is cheap and refreshing, with the iconic Angkor Wat printed on the label. Amok trei or fish amok is the national dish, served steamed or curried with coconut milk in a banana leaf cup. Clothing made from Cambodian silk, or sculptured reproductions of some of the country's iconic temples. Light and casual clothes, but remember to dress respectfully when visiting temples. Cambodia transforms into a festival of colour each year for Khmer New Year (Chaul Chnam Thmey) held in April. One of the most iconic and evocative half marathons, the Angkor Wat International Half Marathon, takes place in and around the Angkor Temples in early December. Boat races and partying are the order of the day on the Tonle Sap for the annual Water and Moon Festival at the beginning of November. More information on Events in Cambodia. -Cambodia is home to the largest freshwater lake in Asia - the Tonle Sap - which covers a whopping 23,100 square miles (60,000 square kilometres) over the monsoon period. -The great temple of Angkor Wat is the largest religious monument in the world. -A large proportion of Cambodian young men are Buddhist monks for a short time. -Cambodia was under French rule from 1863 to 1953. A friendly and upbeat attitude and awe-inspiring ancient temples make a holiday in Cambodia an adventure not to be missed.